Bean dip is my jam. I love the stuff. My mom has been whipping up her amazing bean dip to take to parties and family functions for as long as I can remember, and I find myself making it again and again. 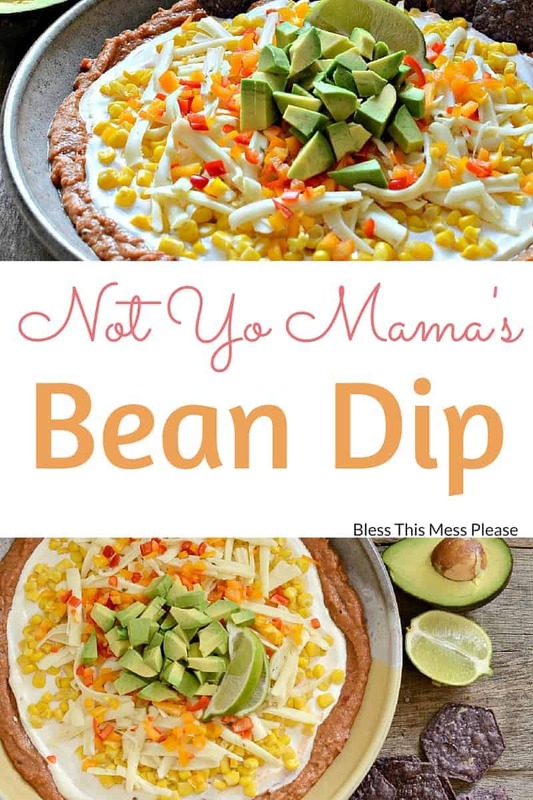 It’s super easy, it travels well, and who doesn’t like a creamy cheesy bean dip?! Appetizers and finger foods are in high demand this time of year and I’ve got just the recipe for you today. 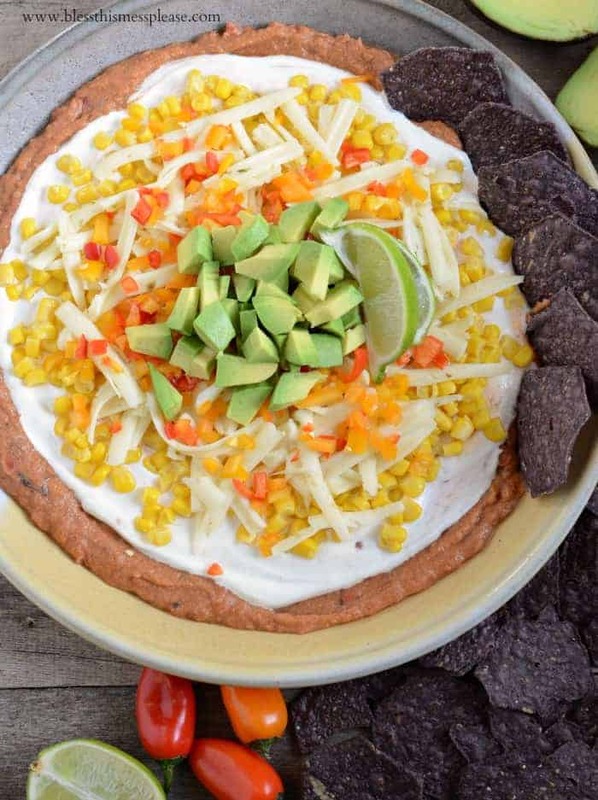 There are two secrets for making a truly amazing bean dip. First, you season and then whip the beans. Whip ’em, whip ’em good. This is the base of the dip and a step to not overlook. Adding canned tomatoes or salsa and spices to the canned refried beans and then giving them a good once over with a mixer makes them light, flavorful, and a stand-out foundation for the dish. The second secret is the chips. The chips you serve with your dip need to be awesome but they also need to look like a million bucks. I love Food Should Taste Good Tortilla Chips and I’ve teamed up with them today to bring you this recipe and chat all things tortilla chips. I’ve been a big fan of this brand for a few years and I’m pleased as punch to be working with them this holiday season. Thanks for enjoying right along with me! Have you ever had Food Should Taste Good Blue Corn Tortilla Chips? They are what I used in my pictures today. They are total show stoppers (on top of tasting great). My kids were fascinated by the color and then totally in love once I convinced them to try them (three-year-olds don’t trust new foods). I’m also a big fan of their Sweet Potato tortilla chips as well as the multi-grain (which double really nicely as a cracker because of it’s nutty taste, making them awesome for hot cheese dips and/or cheese balls!). You don’t have to stop there though, they have a ton of different flavors including jalapeño and cheddar! Food Should Taste Good Tortilla Chips are gluten-free, all natural, and made with wholesome non-GMO ingredients. There’s no guilt munching on these snacks. Isn’t that pretty! 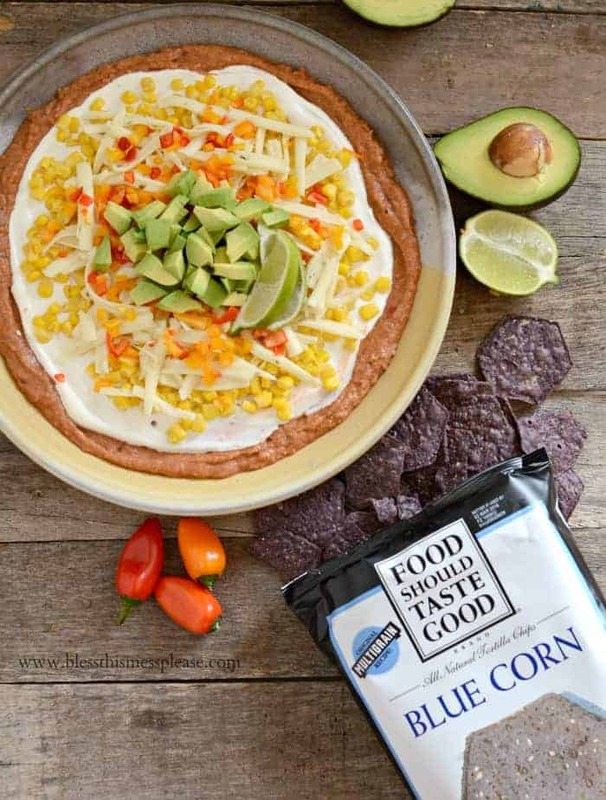 Savory beans, spicy cheese, little pops of sweet corn, and crunchy peppers, all served on those lovely blue corn tortilla chips. Eating the rainbow never tasted so good! In a medium bowl add the beans, diced tomatoes, and spices (chili powder through salt). Beat well with an electric mixer on high speed until the beans are light and fluffy, about 1 minute. Spread the bean mixture into the bottom of a 9×13 inch baking dish (or something similar). Stir the sour cream well with a spoon and then spread it over the bean mixture. 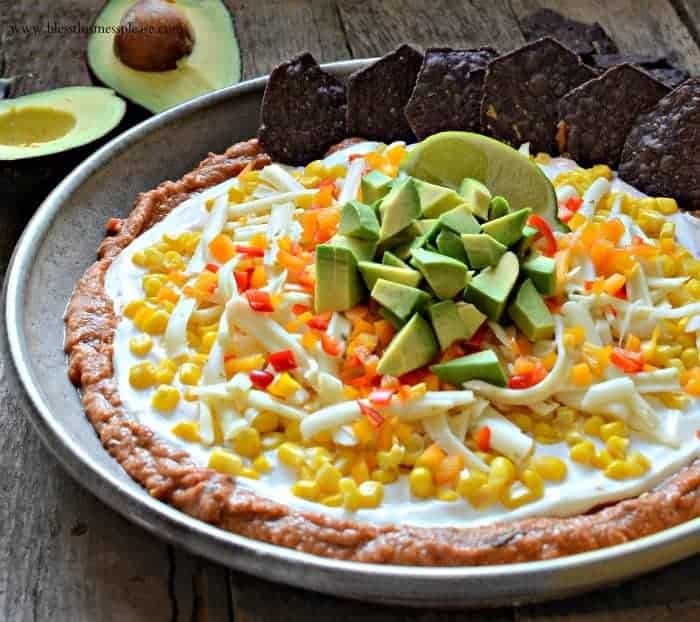 Sprinkle the corn over the top of the sour cream, add the grated cheese, sprinkle the chopped bell pepper over the cheese, and then top with the diced avocado. Serve right away or refrigerate until ready. Serve with Food Should Taste Good Blue Corn Tortilla Chips. If you don’t want this dish spicy, substitute a nice cheddar cheese for the pepper jack. If you like a little more spicy, add a chopped jalapeno in with the bell peppers. You can also add a little hot sauce to the beans before whipping them. This recipe is very easy to double. Use a big can of refried beans (or 2 little ones) and use the whole can of diced fire roasted tomato, and double everything else. Put it all in a jelly roll pan to serve. I normally make this bigger batch to take to large parties. If you happen to have leftovers store them in the fridge. I like to heat the leftover bean dip up and then serve it in a flour tortilla the next day for a delicious (and easy) bean burrito. Best leftovers ever. Seriously though, you’ve got to try this! It’s going to change your bean dip game. I’m always on the hunt for new dip recipes! What is your favorite dip and which Food Should Taste Good tortilla chip would go best with it?! Disclosure: Food Should Taste Good sent me product to work with and has compensated me for my time. Thank you for supporting me and the brands I choose to work with! All opinions are my own. Personally, I would serve the blue tortilla chips with this too. I love the flavor and texture…..and the shock factor from those who have never encountered a blue chip. I am a big fan of blue cornmeal also. Makes a beautiful looking cornbread, and it is soooooo good! I may have been guilty a time or two of putting a few drops of blue food coloring into milk…..blue is such a fun color!! That dip looks AMAZING!!! I think I’ll be making it this weekend! Thanks for the great comment Deb, you are always so kind. This looks amazing! Would that seasoning blend work for taco meat, fajitas that sort of thing? I love it, great colors and textures. Great Recipe, Melissa! Thank you for sharing! 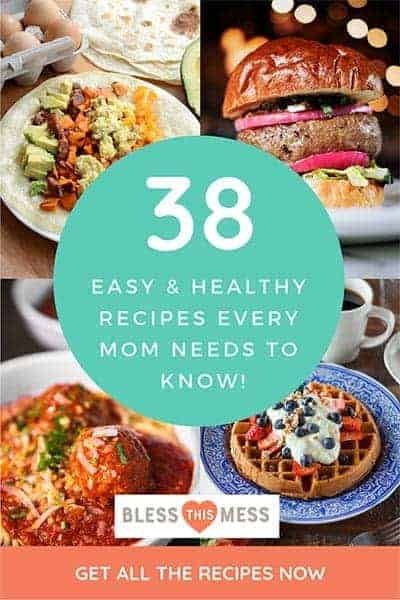 We make a similar one at our house, with homemade guacamole and salsa. It’s always a popular potluck dish for all kinds of occasions. 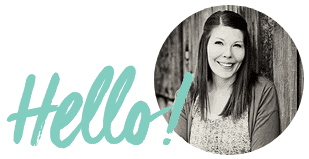 PS – I love those blue tortilla chips! Next party! I’m making. Thanks happy new year!